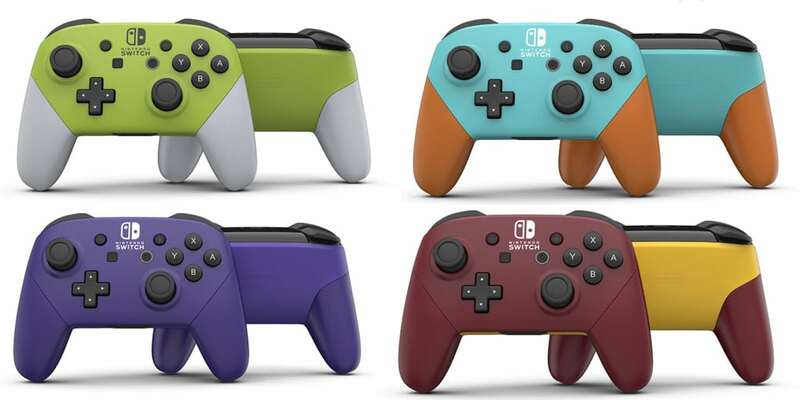 Custom Nintendo Switch Pro Controllers by Colorware | Nerd Much? It’s no secret that we love the Nintendo Switch, and we can’t wait to find out what new Switch games are announced on Tuesday during Nintendo’s E3 2017 conference. But while we’re waiting for that sweet, sweet goodness from Nintendo, themselves, it looks like another company by the name of Colorware has something else in-store for us: Custom Nintendo Switch Pro Controllers. Colorware is taking a page out of Microsoft’s new Design Lab initiative with a similar platform for creating a custom Nintendo Switch Pro Controller. With their platform, you’re able to choose from 58 different color options, two finish types (matte or gloss), and you can customize three different sections of the controller — the main face, the handles, and the back. What is a bit surprising is that you’re unable to customize any of the button colors (as you’re able to do with the Xbox Design Lab and similar platforms). However, I guess having at least some options for your Switch controller is better than the default black that Nintendo currently has. The custom controllers will ship about three weeks after you place your order, and the controller will run you $129. Sure, that’s a bit steep for personal liking, but these controllers might be too incredible-looking to pass up. For now, I’ve hidden my wallet.